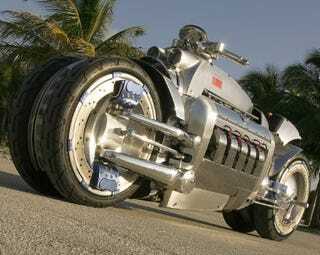 Chop, Chop: Chrysler to Build the Tomahawk Motorcycle? Cripes on a bike! Word is the 500-hp Tron-a-be, the Chrysler Tomahawk, is coming soon to a bazillionaire near you. Chrysler's reportedly greenlighted the Viper V10-powered motorcycle as a limited-production model. If you'll recall, the batshit-mad Tomahawk scared the bejesus out of onlookers at the 2003 auto shows. Arguably, production started late in 2003 with a hand-built reproduction sold via the Neiman Marcus Christmas book that year. The new models will reportedly cost in the neighborhood of $250,000 each. Of course, if that's too much, you can always have this one.